As a car lover, it’s important you have a space that lets you indulge in tinkering with your vehicle and keeping it in good order. Here’s how to create the perfect garage space, ideal for those Saturday afternoons spent sprucing up your car inside and out. Much like your car, your garage needs a smart looking paint job too, and you’ll require exactly the right type of paint product. That means you’ll be looking to buy industrial floor paint, which provides excellent, hard wearing protection for garage floors. This enables you to achieve that polished, showroom look if you opt for a paint that has a high shine finish and you can seal it afterwards to protect the floor and make maintenance easy. You’re going to need places to store your tools and equipment, so that they’re easy to grab and find when working on your car. Labelled storage boxes lined up on these shelves will help keep things looking neat and in order and if you don’t have much wall space you could try and install some suspended ceiling shelves to make more room for the car itself. Here’s a great tutorial on how to make your own. Don’t forget shelving under your workbench. This area often goes unused but it’s perfect for old cans of paint or even storing your floor jack out of the way. You want all your car washing equipment in an easily accessible place in the garage, preferably near the doors where they’re easy to reach. Why not create a ‘car wash station’ in your garage? Set one up using a tall drawer unit with easy to manoeuvre wheels and fill the drawers with everything from various wash cloths and sponges to every type of car wax and shampoo you could ever need. Screw a towel rail onto the side or onto a wall above where you store the drawer unit, to hang wet wash cloths from once you’re done. Perhaps you could even have a tap and hose pipe installed nearby to make things easier? … is another’s treasure. Take old parts from vehicles and turn them into functional or decorative items to place in your garage. An old tyre rim can easily become a hosepipe holder or an old car seat can be turned into a cool stool with wheels to move around your garage in while working on a project. This site has loads of good ideas on how to turn old parts into something useful. 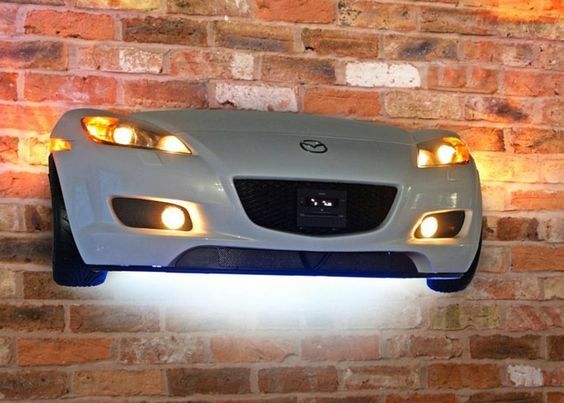 It’s a great way to decorate your garage but also create something useful in keeping with your car loving theme. That radio and speaker system in your car is great but you’re going to need something similar in your garage space to capture that driving feeling while working on your car. Get something that you can hook your phone up to and blast out the music while spending time in your garage. Someone on Pinterest has combined taking vehicle parts and a great sound system and created a speaker that looks like a car bonnet coming out of the wall. Check it out here for inspiration. If you are in the market for vehicle parts for your car or van check out the Part Finder Website.